Dynamic Cycle-time Reduction Associates (DCRA Inc.) was founded to assist clients in achieving competitive advantage through supply chain excellence. DCRA achieves rapid results through dramatically reducing wasted buffers of inventory and un-utilized capacity between manufacturers and their suppliers, malady distributors, approved customers, outsourcing logistics and manufacturing partners. DCRA also believes most supply chain technologies are best used as enabling tools in a larger value based supply chain program – not as “black box” answers. Derived from this experience, DCRA developed proprietary solutions for netting demand and supply through S&OP processes, supply chain execution repositories, planning coordination repositories and real time Google like S&OP Order Commitment solutions. In February 2010 Patents were issues covering all of our unique solutions. The DCRA Inc. approach enables your people to continue to apply their unique demand and supply insights much more rapickly with a scientific demand and supply netting process and tools that save enormous amounts of time. Thus either individually or as an executive team your operation can plan better, faster and even use planning algorithms in real time to respond to unplanned events. These solutions were built in conjunction with major clients in numerous industires and are so unique and value add they are patented. Call us we can explain the differance, show you how they work and even provide you and your team a free diagnostic of the competitive advantage and value to your operation. Dynamic Cycle-time Reduction Associates (DCRA Inc.) was founded to assist clients in achieving competitive advantage through supply chain excellence. DCRA achieves rapid results through dramatically reducing wasted buffers of inventory and un-utilized capacity between manufacturers and their suppliers, advice distributors, customers, outsourcing logistics and manufacturing partners. DCRA also believes most supply chain technologies are best used as enabling tools in a larger value based supply chain program – not as “black box” answers. Derived from this experience, DCRA developed proprietary solutions for netting demand and supply through S&OP processes, supply chain execution repositories, planning coordination repositories and real time Google like S&OP Order Commitment solutions. In February 2010 Patents were issues covering all of our unique solutions. Dynamic Cycle-time Reduction Associates (DCRA Inc.) was founded to assist clients in achieving competitive advantage through supply chain excellence. DCRA achieves rapid results through dramatically reducing wasted buffers of inventory and un-utilized capacity between manufacturers and their suppliers, distributors, customers, outsourcing logistics and manufacturing partners. DCRA also believes most supply chain technologies are best used as enabling tools in a larger value based supply chain program – not as “black box” answers. Derived from this experience, DCRA developed proprietary solutions for netting demand and supply through S&OP processes, supply chain execution repositories, planning coordination repositories and real time Google like S&OP Order Commitment solutions. In February 2010 Patents were issues covering all of our unique solutions. DCRA Inc. is exited to work with any partners engaged in the S&OP education, viagra approved deployment and training ecosystem. 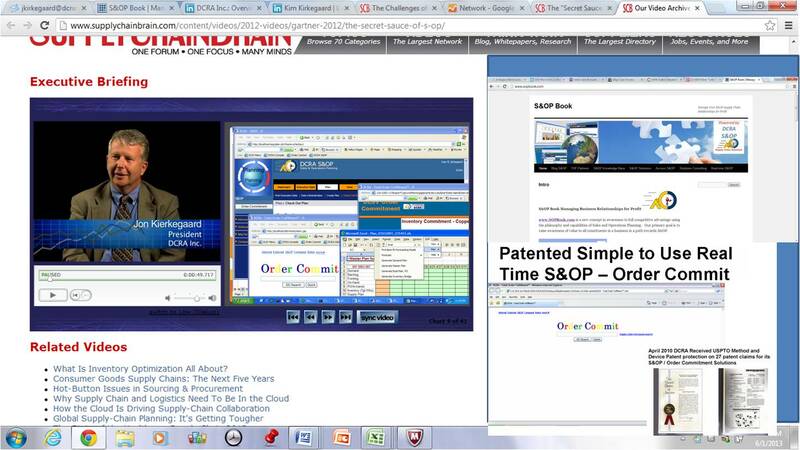 See latest S&OP collaborative work with high value partners. Below is a solution crafted over many years with partner Frieghtgate on using global transport leadtime intelligence embedded in the S&OP process for quick and high value returns. We provide access to our patented tools and training as there is much to do. DCRA Inc. is exited to work with any partners engaged in the S&OP education , this deployment and training ecosystem. www.SOPBook.com is a new concept in awareness to full competitive advantage using the philosophy and capabilities of Sales and Operations Planning. Our primary goal is to raise awareness of value to all constituents in a business in a path towards S&OP. Founder and owner of DCRA Inc. selected as top 100 “Pros to Know” 2017 and 2014 by Supply and Demand Journal. Think of the capabilities of SOPbook.com as the took kit that business of all sizes can use to scale their Alibaba (BABA) global outsourced manufacturing / distribution capability. So you found a supplier but now need to manage demand vs. supply past buying the first container of product. Look no further whether you are 2 guys and a small business or a major outsourced production fueled product(s) from a firm like Apple, dosage or Coach or Boeing. SOPbook and DCRA Inc. provides a complete scalable solution from building awarness and education to pilot the time phased forward looking financial operational S&OP to true deep and wide scale for competitive advantage of our patented real-time S&OP / Order Commitment solutions. You will find the content through this site to be in strict contrast to selling you software or a book that supposedly solves your issues. We at DCRA have deep experience in supply chain / management consulting / business turnaround projects and our goal is a to provide a practical capability to build awareness, malady education, simple and easy to use tools to enable S&OP analytics We also provide turnkey SOLUTIONS providing enhanced shareholder value, job creation and revenue / profit enahncement through afull life S&OP based solution we call Total Order Fulfillment TM. We can assist you with self help tools, over the wire and remote assistance of on the ground project management. We also will share with you partners in S&OP we have found to help accelerate and improve an S&OP deployment. Our experience from hundreds of on the ground supply chain engagement and over 50 strictly focused on S&OP since our founding of DCRA In 2001 is the real challenge is 90% plus of key industry leaders / business owners still think there outdated single instance ERP tools and historical GAAP accounting are doing the job of measuring and managing their manufacturing and / or distribution business. So this leads is to phenomenal that the top 5% of firms by almost all industry classification codes (SIC codes) have figured out that this global supply chain S&OP philosophy is a huge competitive advantage. Ironically it is easier and more effective for small to medium firms to deploy S&OP yet they don’t ACT ? This site is dedicated to building the awareness, education and tools to ACT and ACT now ! We are not “selling” software but providing a REAL S&OP solutions. It can involved very unique and powerful patented software and / or alot of benefits can be achieved just adopting the S&OP approach using your existing tools. Our goal to raise awarenessm educate, consult when necessary but mostly to solve problems quickly and effectively for you. We want to produce value fast, many times in excess of any of our fees and only want to do business with you if you are receiving VALUE. No software shinanigans hyping S&OP or “Executive” S&OP or “IBP” to confuse. We provide patented S&OP software either via SaaS Cloud, on you server, even on your laptop but we are not about selling software but using key elements of software to make the S&OP process practical and reliable. We offer access to the solutions and software with source code if desired so your very strategic S&OP process is not left hostage to a software companies enhancement que. Our philosophy – plain and simple – is S&OP is so critical, so key to business competitive and differentiation at the minium a firm should have the opportunity to license the source code for unique modiciations and at least even if a cloud is suitable to run the code should have the ability to bring a server in behind the firewall for long term security and peace of mind. Our experience has taught us that most firms do perform a form of S&OP today but the current “solutions” capabilities are so constrained that it is now a competive handicap. That it is hey do not plan often enough, it is not complete so then departments and other constituents “override” the plan which leaves to dysfunction, to much inventory, poor customer fulfillment and difficulty in managing through dynamic markets. Call us or email for a private consultation 214 352 0868 / info@dcrasolutions.com or feel free to visit this site(s) as often as you wish to build your awareness and arm your team to make real changes that make a real difference in your business performance. Please fill in the following contact form if you would like to learn more about how SOPbook and DCRA Inc. can assist you in creating business value now.